Special Collections and Archives has a wide variety of maps, many of which are part of archival collections. To understand maps, we must understand their meaning and sometimes their intended use. 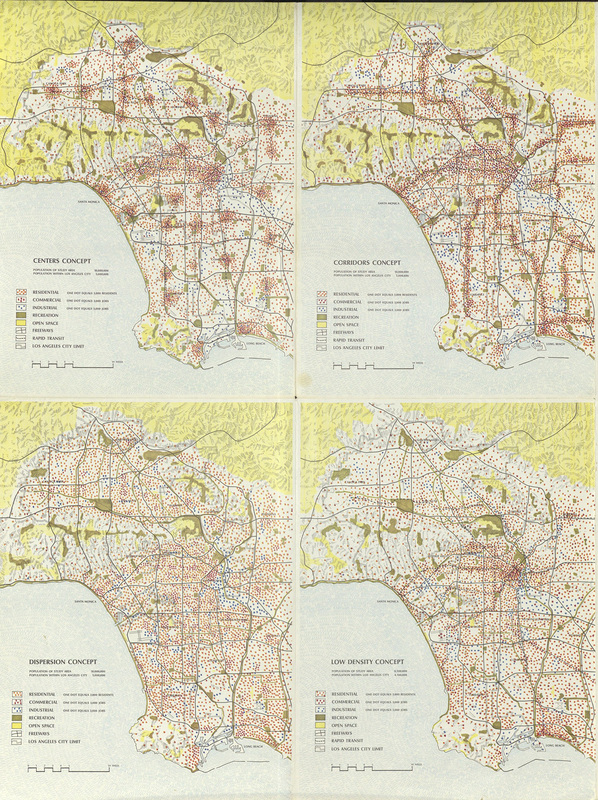 The maps selected here demonstrate how different areas of greater Los Angeles have developed over the years. Some maps demonstrate changes in demographics, while others illustrate various infrastructure projects that have been in the works over time, creating new neighborhoods, freeways, parks, commercial, and residential areas. Some maps are magnifications of specific areas, while others contain broader information that reveals relationships between cities, towns, and neighborhoods. 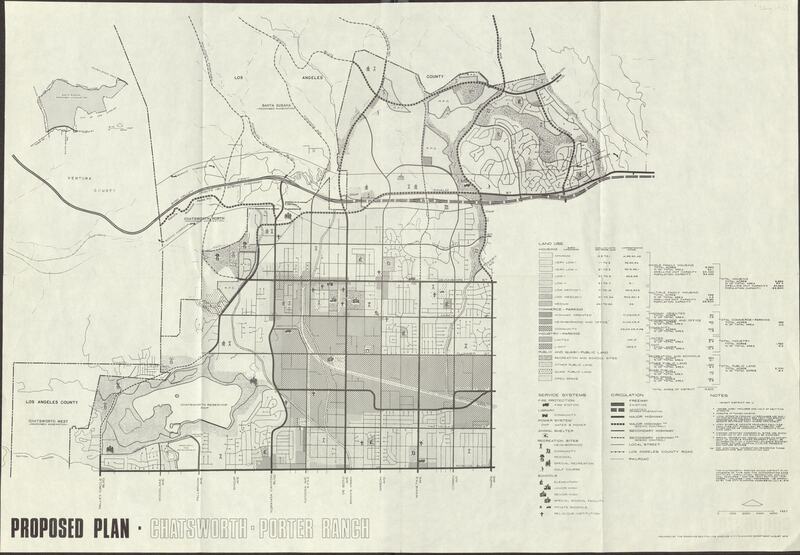 Local maps can shed light on how and why changes have taken place in the areas where we live and work, for example, San Fernando Valley project planning maps of Porter Ranch, Chatsworth, Northridge, and Newhall. Some of the maps that were used for planning are from collections that are not specifically about the development of an area, but that were used in public hearings to highlight either the negative or positive impact it would have on the neighborhood in question. In the case of the Chatsworth - Porter Ranch map from the Northridge Civic Association, we can clearly see that this organization was interested in the impact that planning projects would have on neighborhoods, commercial businesses, recreation areas, and more. 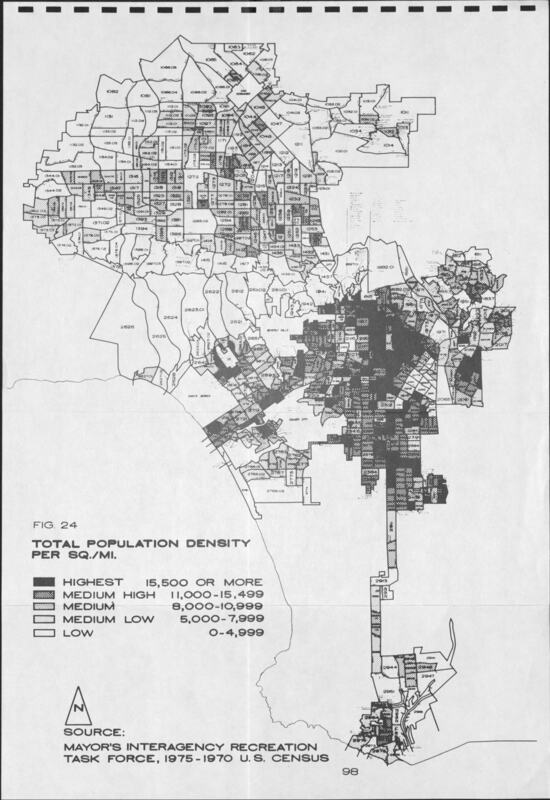 The same can be said for the map that displays the total population density of areas in Los Angeles in the 1970s. In some cases, maps created for one use may be viewed from a different perspective in the future. Although some of these maps seem like they were created a long time ago, a lot can happen in only a few years. 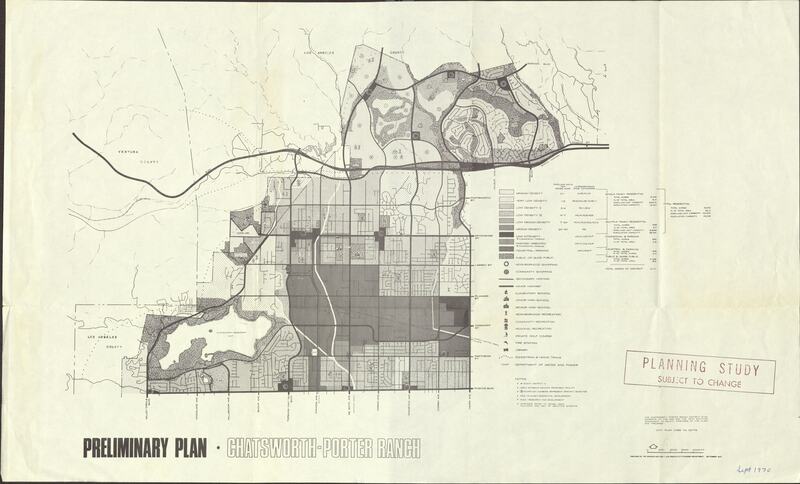 For example, in the Chatsworth-Porter Ranch plan it was intended to have more acreage for residential areas, however in the proposed plan a few years later, the percentage of this area is slightly smaller. The same can be said about the Map of Territory Annexed to the City of Los Angeles. Although the writing is small, we can see on the map the different areas that were annexed, purchased, or added and dates on when this occurred. This map was created sometime after 1924, and much has changed since then. It is unclear when this map was created, but clearly more has occurred since the last entry. This map is part of the California Tourism and Promotional Literature Collection which holds materials meant to attract visitors, settlers, and real estate investment to the state of California. The Industrial Association of the San Fernando Valley Collection consists of material created by a non-profit organization, the Valley Industry and Commerce Association (VICA), which aimed to attract industry to the San Fernando Valley. Two glued maps from this collection contain very different but closely related information on it. 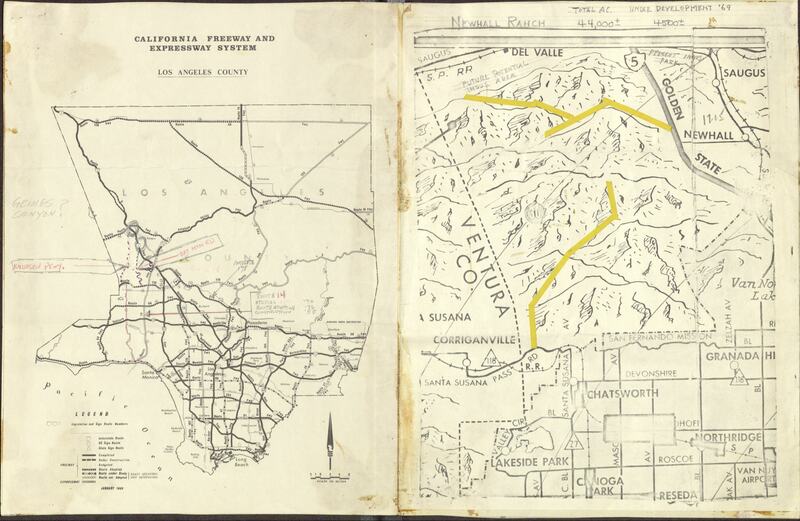 One states that Newhall Ranch is "under development '69" in a total area of 44,000+ acres and the other is a map of Los Angeles’ freeway system with red pencil marks noting other developments on the freeways north of the San Fernando Valley. It is clear that the greater Los Angeles area has a large population spread over a wide area that continues to grow and develop in different ways every day. 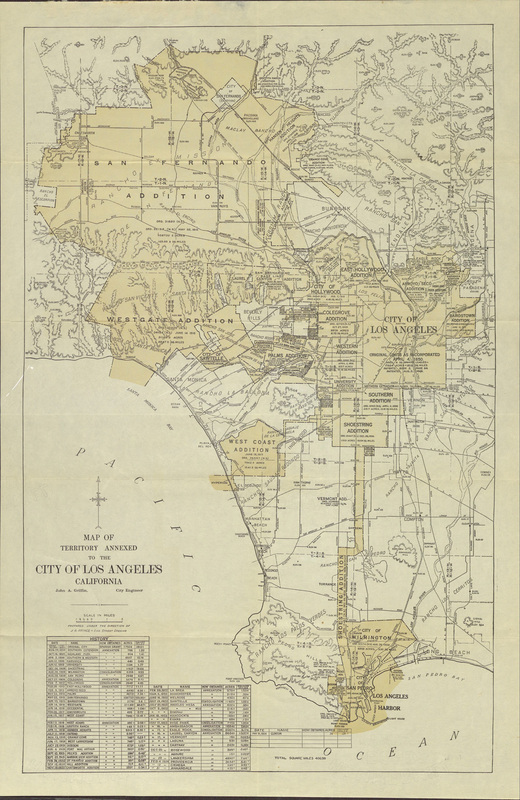 These collections contain maps that were created and used for many different reasons, to attract people to Los Angeles, to challenge what is or is not needed in different neighborhoods, or to attract industry and business. Their use today and in the future sheds light on the history of our changing environment and contributes to our understanding of how we might shape it in years to come.